Back around Christmas (2016) I received an Airspy Mini and was immediately impressed with its performance. 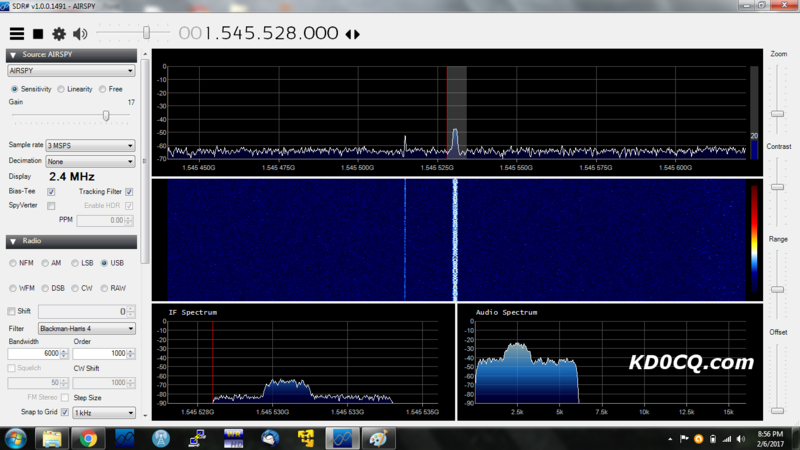 With a simple homemade Vivaldi antenna I was able to receive, if not decode, Inmarsat Aero signals from inside the house through a solid wall. Not too bad. After adding a Nooelec L-Band LNA to the mix I was able to easily capture and decode those same signals from the same position indoors. Pretty good if you ask me. 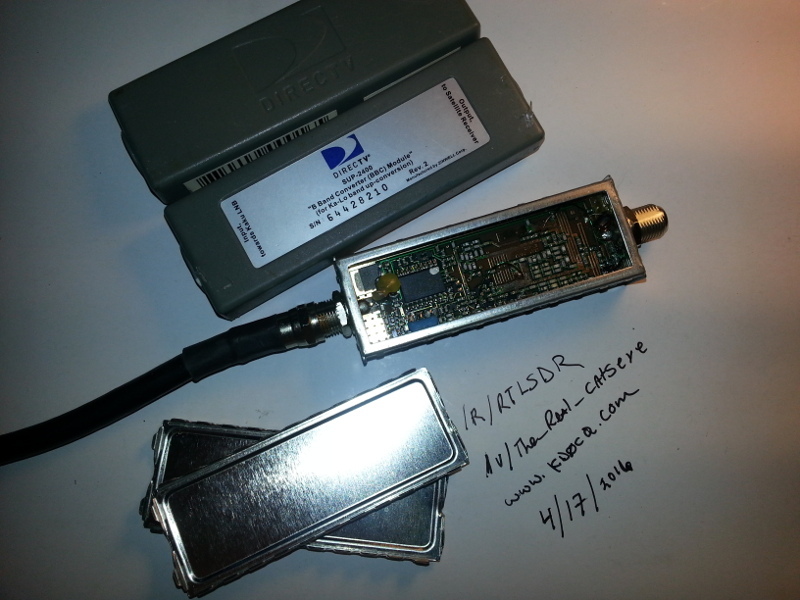 I have at least one of most "improved" RTL-SDRs and the performance from them was much less satisfactory. 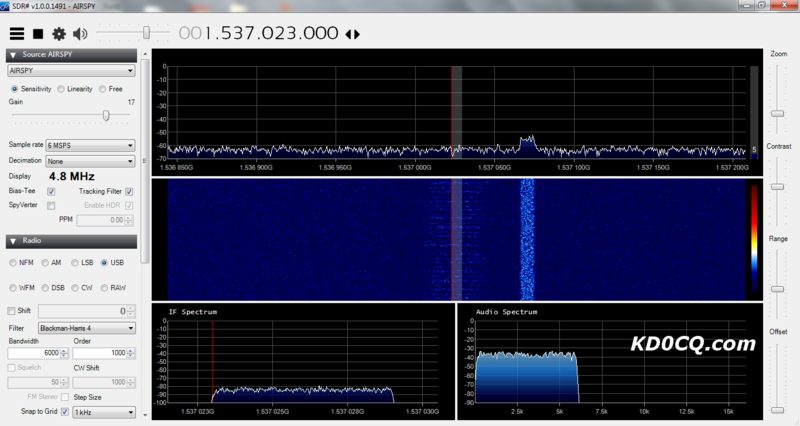 While I could see the signals decoding them was a far more difficult task. Finding the sweet spot indoors and adding LOTS of amplification was a must. 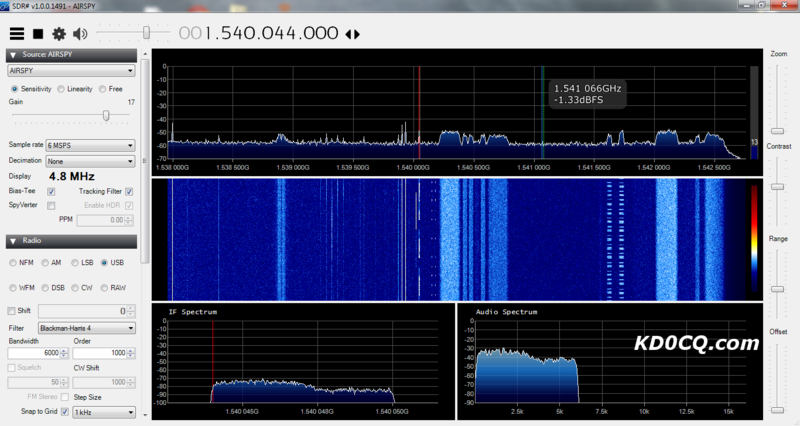 It's doable indoors with an RTLSDR, but I wouldn't reccomend it unless you have no other options. At a hamfest this past year I picked up an old aluminum 33cm 1m point to point dish that had been used in the 33cm ham bands. I recently removed the 900MHz feed and fashioned a feed mount out of some aluminum tube stock and mounted one of my homemade Vivaldi antennas on it. It sat in the yard for about a month while I tried to find time to put it to use. 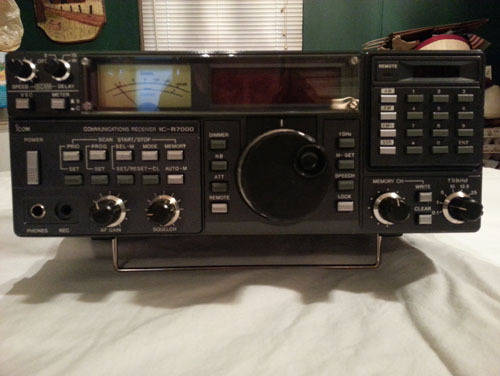 Finally tonight I made some time to put it on the air. I dragged out my laptop and sdr gear and placed the 1m dish on an old push mower so I could move it about to find the correct heading and elevation. I haven't calibrated the feed depth/focal length of the dish yet, just playing it by ear. I'm certain reception will improve once the feed is optimized. Below are the results which are pretty good for a first shot. I'm fairly certain I can improve the signal strength when I mount my homebrew L-Band Cantenna on the feed (and make the proper adjustments for optimal focal length), as in a side by side direct feed comparison the cantenna provided better overall performance in this portion of the band. With this setup L-Band reception using an RTLSDR should be greatly improved over the indoor setup. 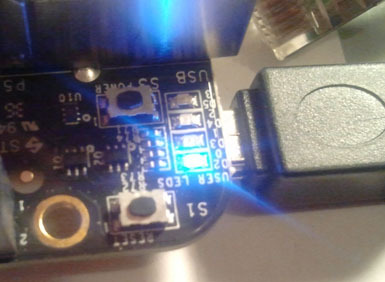 In the coming days, since the weather is forecast to be in the 50's-60's for a change (middle of winter here), I'll try to get out and snap some screenshots using a HackRF and a few different "improved" RTLSDRs. 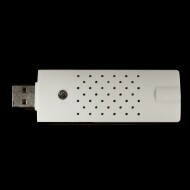 Namely the Nogles.com / ThumbNet N3SDR, RTL-SDR.com Blog V2 SDR (don't have a version 3), and the Nooelec SMArt sdr. In closing, using the Airspy Mini, a Nooelec L-Band LNA, and 1m Dish I was able to see satellite feeds I would have never known were there otherwise.The average signal strengh was pretty good with SNR averaging around 20-25dB. This can likely be improved by optimizing the feed position and utilizing a narrowband antenna (cantenna) at the feedpoint. The dish is a massive improvement over a direct feed antennas. For now I'll call this little adventure a success, with room for improvement. Here are the results, Click each screenshot for a full sized image. 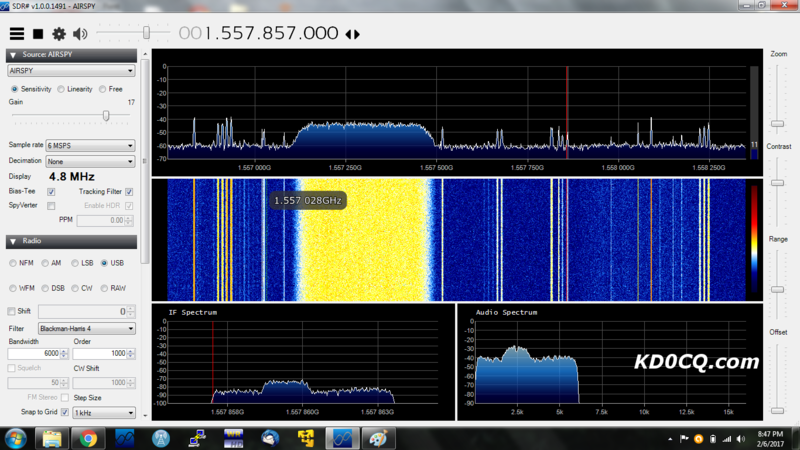 1 Comment on "Exploring L-Band Satellites With Airspy Mini And A 1m Dish"
I am VU2UUU from India. 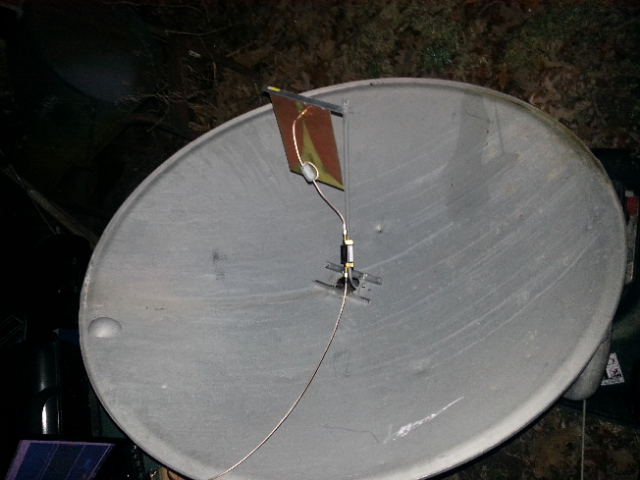 I have recently homebrewed a 1.5 GHz Helical Antenna and fixed with a Dish Antenna. I do not have a LNA. I use SDR# software but unable to see any signals in the 1.5 GHz spectrum. 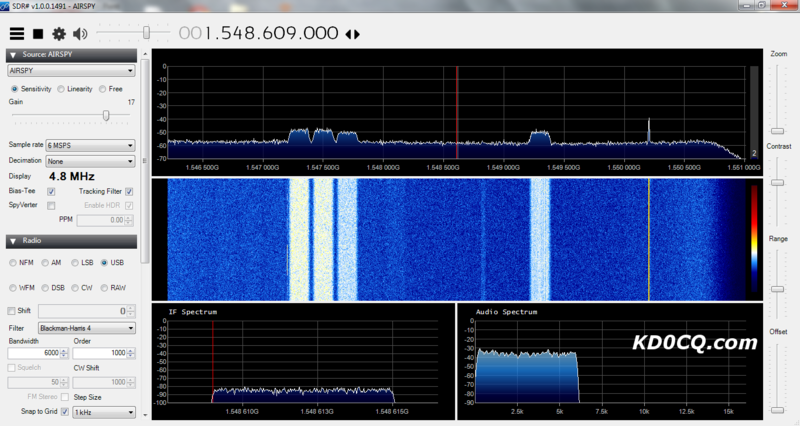 Can you share with me the frequency where I can see such L-Band signals and from which Satellites? Also please help me with information which will be useful for such setup.